At the very beginning of the game planning and development, we as developers have had several specific objectives: develop easy-to-play and fun 2D sci-fi game with various ways of level progress using all kinds of character skills. But it was also necessary to deliver little story depth in form of lore. It was then my turn, to invent such plot. First of all, I had to introduce a game world to the player, and also clarify basic game mechanics and controls. So I had to adapt first location to these facts. It was not easy decision. The beginning had to make sense in relation to lore, give players important information, give access to abilities (aka technologies), introduce hiding and combat mechanics, dialogs and start game story in general – state motivation and directions for the main character. So I chose solution in form of company dedicated to medicine and technology – Aid Technology. Such environment provided relatively calm location, where player could learn a lot of information about story from “first hand”. I also justified initial approach to primary abilities and technologies. These technologies served as main motive to first problems at the same time. They will result in motivation and will give further directions of the main character – Benjamin. Of course I knew that this beginning isn’t really original. Similar concept of technological corporation where something goes wrong have we seen in lot of different (sometimes very good and famous) games. It is important to realize that these games didn’t really come with something new – they were just editing and combining existing concepts. We responded similarly. It doesn’t make any sense to worry about if something similar isn’t already elsewhere. Our goal was to come up with suitable settings and adapt it to our game world – which we’ve done. So I had rough idea where should story begin. Now it was necessary to draw up layout and design of location that would make sense according to my idea (to the extent possible). Aid Technology should represent modern and advanced scientific society, on the other hand it should serve as refuge and home of scientists which work here. I had to take in account where will they live, what will be their background and how will be cared about them. This resulted in the first part of the building. 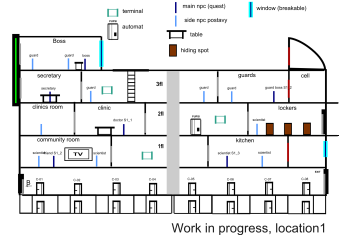 Naturally, I’ve placed rooms (or rather sci-fi „cells“) of scientists and co-workers, kitchen, common room, clinic, security and offices there. I had intended to make close-up on closed life in Aid-Tech community by this way. Still, there were some concessions. If I should create really appropriate infrastructure of such big company, there would necessarily have to be more offices, maintenance, changing rooms, etc. In terms of functionality and clarity of the game would be such vastness and complexity pointless. Therefore, the company is conceived as a system of more scientific (smaller) blocks and the player moves in only one of them (block C). 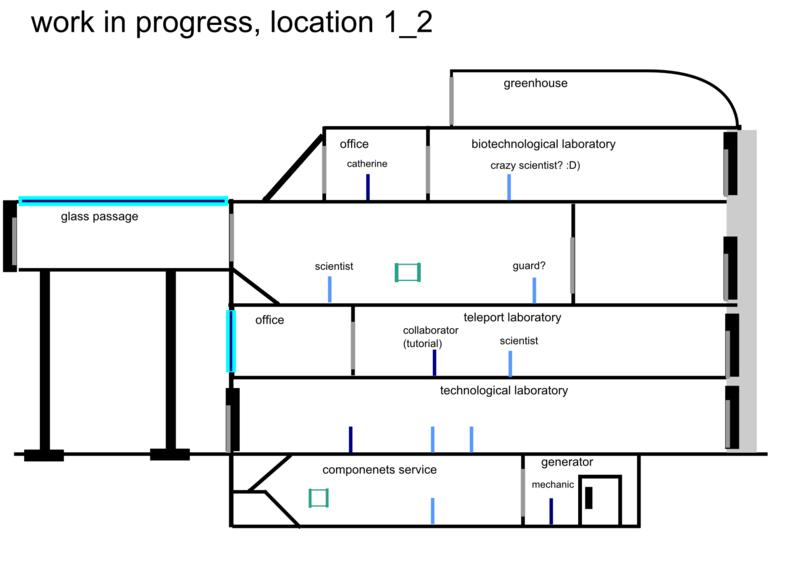 On this first “living” part joins part of the laboratory that looks more at the actual research of company and some technology that you will learn later. 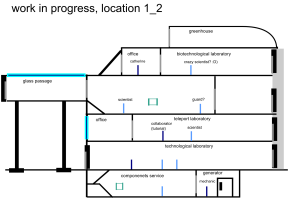 Laboratories are separated on floors to few sections- biotechnological, technological and teleport section. Again, this is a pretty clear indication of the sectors that have essential role in the game. Both sides of block are conceived as a tutorial for player, where you’ll try the basic controls, dialogue system, using of abilities or first quests. 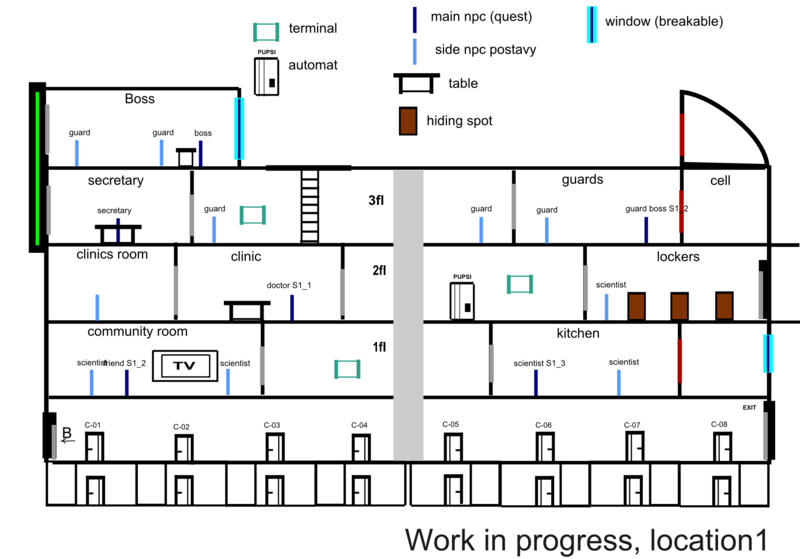 When coming up with the layout of rooms or characters, I had to take several factors into account. We had a basic idea of the beginning, but the story has to come to a turning point, which clearly define next goal of player. Without mentioning spoilers I will mention that the situation in these locations will soon change. We get to the first action part, where players try for the first time some of the learned skills in practice. I had to take in account this certain unnamed twist and changing context of location. The bigger issue represented distribution of first locations, because it should serve multiple purposes – to make sense, effectively familiarize players with the world and to work in action part. Even more, I had to take into account the distribution of NPCs (whose position can be changed by your influence) or possible player decisions. Each player may choose to do things differently, go a different route, and perform different quests, so it was quite a challenge to reflect all these things. If I succeeded, you’ll be able to judge for yourself in the game. This is all for now about first ideas and thinking up. If you have any questions or comments, don’t forget to write it down in the comments. Follow us for next news and articles from development. Thank you for your support, team Aid-Tech.